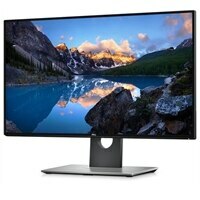 Dell UltraSharp 27 4K Monitor: U2718QProductivity without boundaries. The world’s first 27" 4K monitor with Infinity Edge and Dell HDR1. See stunning colors and exceptional details on a virtually borderless display. Lifelike visuals: Dell High Dynamic Range (HDR) projects images with striking depth, captivating your attention and giving each job a gorgeous finish.